Art for children is a constantly developing sphere. Such an unpretentious kind of art activity as unconventional painting with leaves imprints will do for small painters for whom a brush is a complicated thing to use properly yet. It appears that an ordinary leaf of a maple, a poplar, an oak or a birch can turn into an instrument of art creativity not worse than a brush. I use this kind of creativity with kids from the age of four. 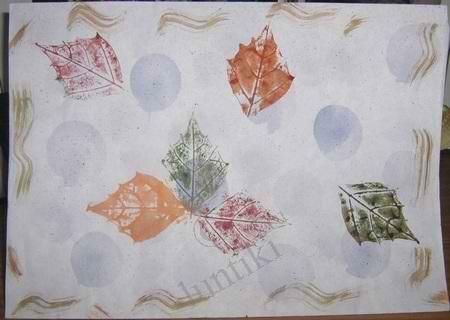 A kid covers a leaf with paints of different colors, then puts it on a sheet of paper with its painted side to get an imprint. Each time a new leaf is taken. The made picture is finished with paints. And here it is. It's lovely, isn't it?